Performers needed for the 2013 Bolton Bazaar. The Bolton Bazaar is on the lookout for more performers to join their annual show on Thursday 4th July. The event already has some individual singers so they are particularly looking for more groups or choirs, plus dancers and other entertainers. Bolton Bazaar want to have acts from every area of Bolton to represent the diversity, culture and talent within our communities and neighbourhoods. That’s what the bazaar is all about, and it’s also why they are running awards at the same time, to honour individuals who have worked hard in their local area to improve life for residents. Entertainers of all ages are welcomed, as long as they are the very best of what Bolton can produce. The Bolton Bazaar organising committee are currently hosting auditions at The Excellency, Carlton Street, Bolton, each Thursday from 6pm to 7.30pm. Time slots for the auditions can be booked by contacting 07530 040939. 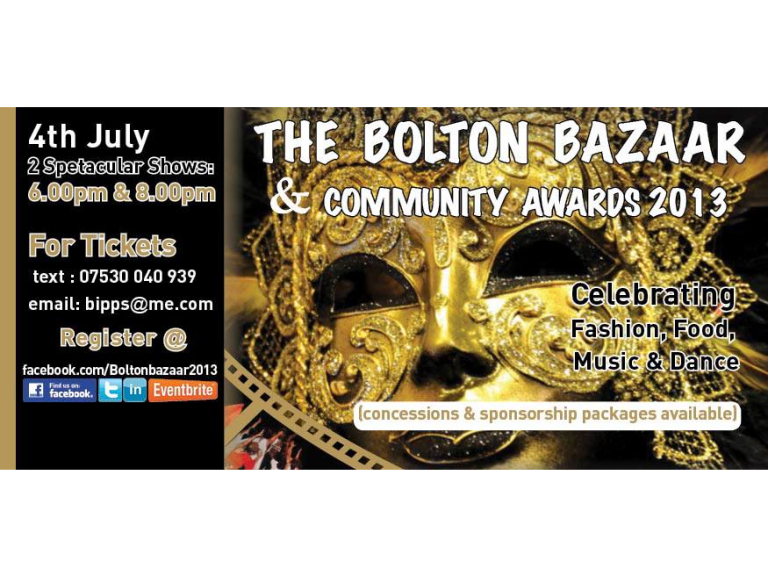 The bazaar grew out of the Apna Bazaar and has become an annual way of highlighting talented individuals and groups, providing a public platform at this high-profile event when the Mayor of Bolton, Cllr Colin Shaw, will be present. Over 6,000 people have attended the event in the 11 years it has been running and the talent on show only seems to get better every year.